It was the Sixth Annual "Heart of the Valley" Quilt Shop Hop May 1, 2 and 3, 2015, featuring shops from across the San Joaquin Valley. Bright and early Rhea and I started on road trip on Friday, May 1st. The hop starts in Turlock and ends in Bakersfield, California. Rhea and I started our adventure in Clovis at the Quilter's Paradise. This store never fails to delight -- friendly staff, attractive store, and lovely fabric. I found some felted wool at this shop for a project I am planning and some really cute chicken fabric that will make a cute apron or potholders. 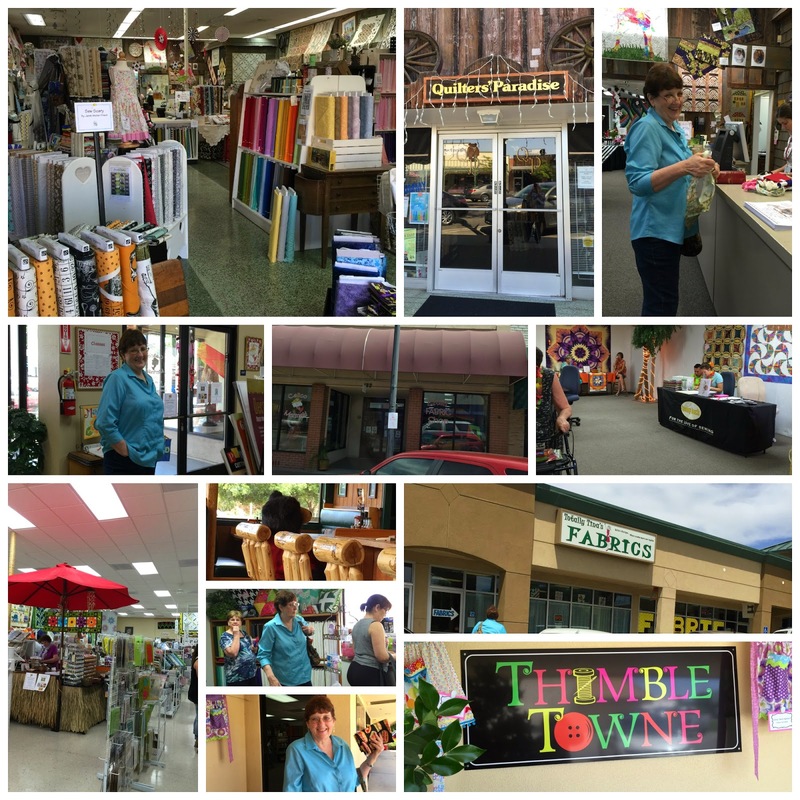 Next on our agenda was Thimble Towne in Visalia. These people know how to have fun! There was a photo station as well as yummy food. I found the cutest fox fabric here and purchased a Yellow Brick Road pattern. I have never made one of these quilts and am anxious to get started. You would think because of the fox theme it is for my new grandson, but no, it's for me. I love little foxes! Two stores were in Porterville, Calico Mermaid and Totally Tina's Fabric. We stopped in and perused the goodies each store showcased, snatched some yummy goodies, then went to lunch at the Black Bear Diner, one of my favorite chain restaurants. A Gobbler sandwich for me, please. Delicious! Back in town, we left each other's company. It was already past 4 o'clock and I had a birthday dinner to attend for my granddaughter. On Saturday, I finished the last leg of the shop by visiting Bolts to Binding and Strawberry Patches, both in Bakersfield. Each shop we visited gave away goodie bags of quilting gadgets and patterns. Water bottles, fat quarters, finger lights were among the loot I collected. Thimble Towne gave participants a kit to make a darling scissor holder. This was a quick project and will really come in handy in which to store my embroidery scissors. I think this was my favorite treat. Can't wait to get started on my Fox quilt, but I have a baby quilt to finish first. The baby shower is Saturday. This quilt features mermaids and sea creatures.